Mostly, I’ve found you either love ’em or hate ’em. And I guess I can understand that, though I’m fascinated by the polarity. The USC Trojans’ Football Team have passion. They also have talent, confidence, style, and tremendous (financial) support. Maybe that’s what bugs people so much. From the other side of the coin, it might look like arrogance, pride (not the good kind), excess, and an entitles-spoiled smugness. The Trojans live in Los Angeles, land of the beautiful people. The gentle omni-present sunshine warms our athletes year round. And except for the smog, traffic and general LA sprawl, there is little to complain about in SC life. All that may help, but that doesn’t change the pursuit to be #1 in National College Football. Watching every weekend, I’ve learned that we still, ultimately, always have ourselves to beat first and foremost. We have seen our #1 ranked team lose this year against unranked Oregon State and last year against Stanford, right after two sound victories against Virginia and Ohio State, BOTH ranked top 20! When there is no specific reason for losing, it comes down to the mental game. If you’ve ever won anything, you know that there are good days and bad days. Part of the practice becomes making the good days the norm when it comes to your mental game. Mental self-discipline, big picture vision, focus on the goal, a nimble ability to adjust, perspective; these are all essential pieces of the mental game. The Trojans demonstrate an excellent mental game most of the time. It comes down to self-discipline, the cornerstone of the mental game, and therefore a key tool for success. There’s so much more already written about success. Also see Jack Canfield, Napoleon Hill. Watching the Trojans every week gives me a chance to evaluate my mental game and learn from theirs. I find out where my pitfalls may be and what needs strengthening. It is also a pleasure to watch what works. It’s pretty hard to argue with winning. 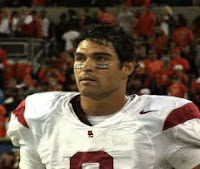 Mark Sanchez & Pete Carroll(photos above) demonstrate in their successes and failures the terrain of the mental game. And how essential it is to keep your eye on the ball.